New Zealand has published Balance of Trade and the US will publish Personal Income m/m and Personal Spending m/m. 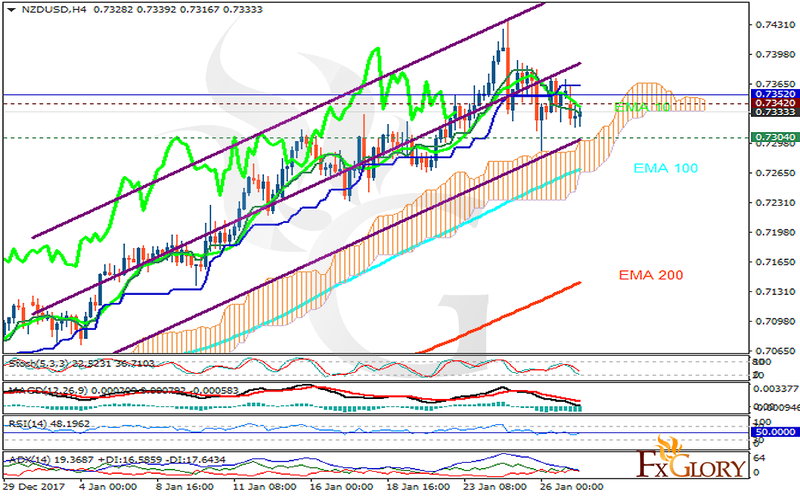 The support rests at 0.73040 with resistance at 0.73420 which both lines are below the weekly pivot point at 0.73520. The EMA of 10 is moving with bearish bias in the ascendant channel and it is above the EMA of 200 and the EMA of 100. The RSI is rising towards the 50 level, the MACD line is below the signal line in the negative territory and the Stochastic is showing downward momentum. The ADX is not showing any clear signals. The price is below the Ichimoku Cloud and above the Chinkou Span. The Tenkan-sen is showing a downward trend while the Kijun-sen is showing a horizontal trend. The indicators are showing a bearish trend while the support line seems to be too strong to be broken, therefore, long positions are recommended towards 0.74.